Our JLTi PhonoPre Phonostage, then our SVP-2 in the middle of our range - which just got a rave review by Roy Gregory in the recent HiFi magazine, and then of course also our absolute state of the art RTP3D preamp. The RTP3D is the result of 25 years of ongoing development based on unique circuit concepts borrowed from the instrumentation world. But as we would never consider it can’t be improved in the future, it’s been constructed to be easy to upgrade if revisions are found that improve the sonics. 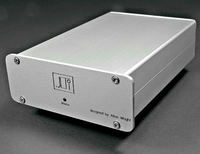 The JLTi PhonoPre is a solid state phonostage that offers superb sound quality at a modest price. Built in Switzerland to Vacuum State standards our Southern Californian dealer claims it sound better than anything under USD 3000. 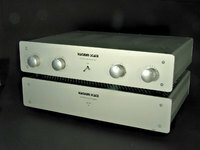 He also states that in "shoot-out" it bested 3 phono stages over USD 3500 up to USD 5000. Further he only knows of two phono stages under USD 5000 that he would pick over it (or over it with upgraded PS) so far, one at USD 3650 and the other at USD 4000. Our phonostage sells for less than half that! Read more about it on our Reviews page.